Make your '14-Current Chevrolet Silverado stand out from the rest with this great-looking Rally style Body Side Graphic kit. As you can see, graphic package is not just a generic set of stripes. Kit is specifically made for the '14-Current Chevrolet Silverado and Silverado HD and will not fit any other vehicle. 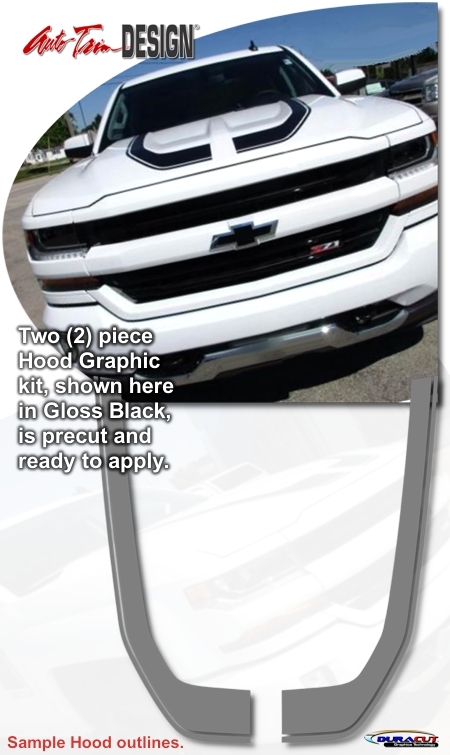 1 Chevrolet's Silverado Rally stylized graphic consists of a two color graphic with the base color main graphic and a highlight in a secondary color. Kit offered herein is manufactured as a one (1) color graphic manufactured with automotive grade premium cast film in a solid color as selected. 2 Graphic kit is designed as a multi vehicle model fitment. 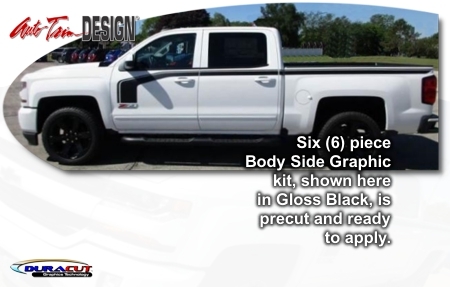 With careful trimming after successful application, kit fits Regular, Double and Crew Cab models of the Chevrolet Silverado and Silverado HD in all Rear Box sizes (Short, Standard and Long) Dry-fitting is suggested to become familiar with proper placement. Please see the kit Parts List for more application information.